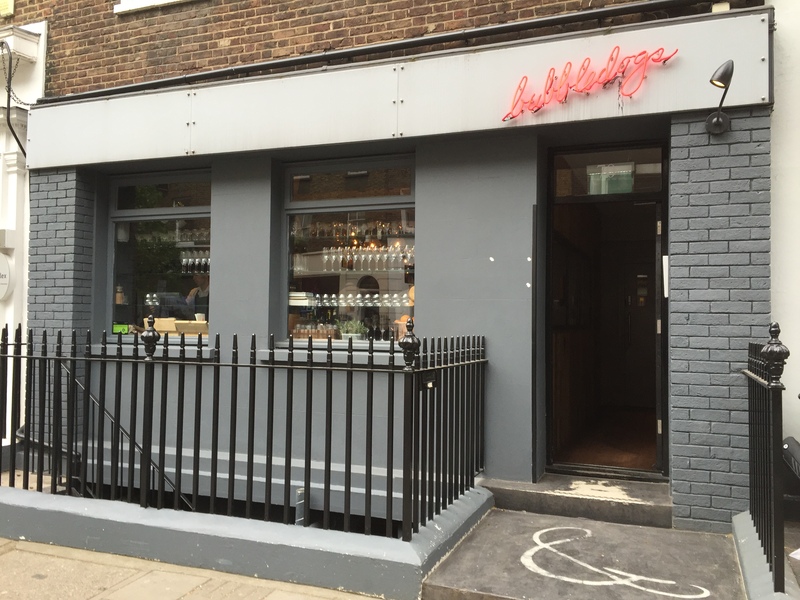 My friend Joanna has wanted to visit Bubbledogs ever since the opened but the last time she was in town they were closed. So when she visited me again this weekend just past to make sure that she didn’t miss out we went along straight from work on Friday evening. 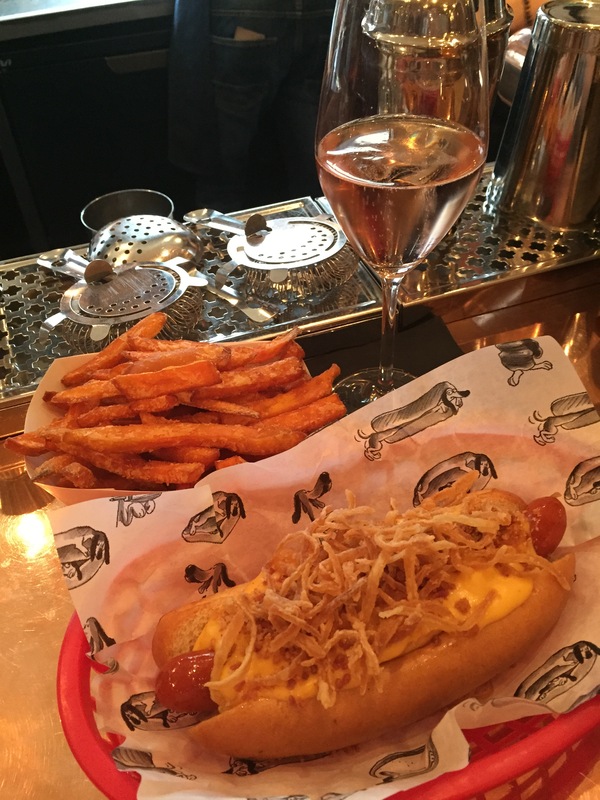 The concept behind Bubbledogs is easy to understand if a little odd; glasses of champagne (the bubbles) are paired with hot dogs (the dogs) in a high-end meets low-end mashup. Inside is absolutely tiny with very high stools which weren’t the most comfortable things to sit on. We were perched at the bar which was definitely the best place to be as you could watch the bartenders at work as they whipped up a cocktail or three. As we were there for the Bubbledogs experience we decided to skip the cocktails and try one of the champagnes on offer. The list is full of names that you probably won’t recognise (no Laurent-Perrier or Bollinger here, instead they specialise in growers champagne made by farmers in smaller champagne houses. 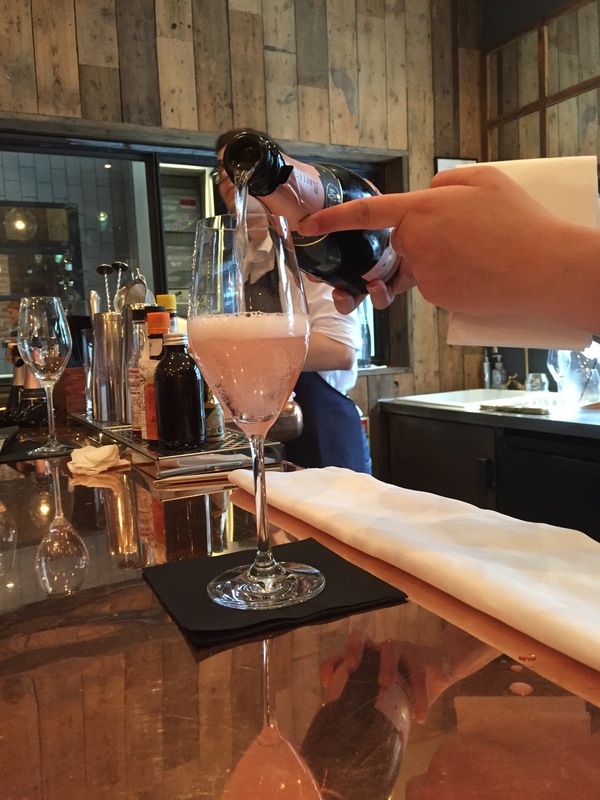 We both had glasses of the Raventos i Blanc, De Nit, Rosé, 2010 – Sant Sadurni d’Anoia simply because it was the cheaper of the two rosés on offer – sorry I’m not an expert in champagne whatsoever but it was very crisp and delicious! 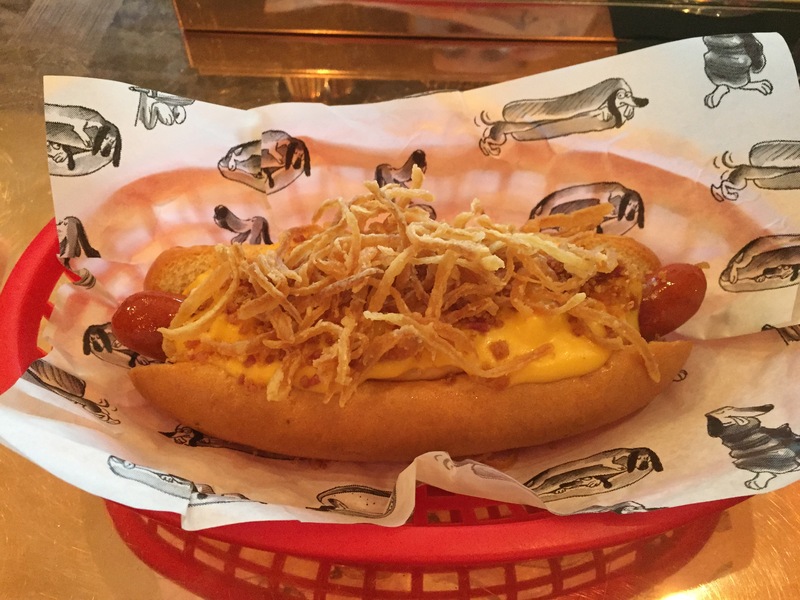 For food I ordered the Mac Daddy – a hot dog smothered in macaroni cheese and topped with fried crispy onions and bacon bits. When it arrived in a little red plastic basket which you would expect in an American diner I was a bit disappointed. It was OK and I absolutely adored the crispy onions but I thought it was relatively small for the £8 price tag and could have been improved by something a bit different, perhaps a crusty baguette, from the standard hotdog buns that were served which struggled to contain the toppings. 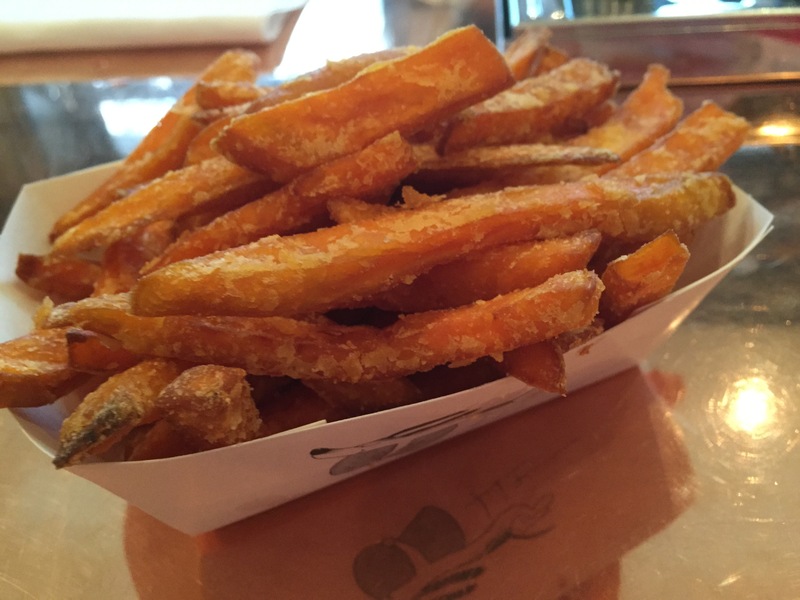 We also had a side of the sweet potato fries to share which were the absolute best. Crispy on the outside yet still lovely and fluffy on the inside. My main complaint was that the service was slow which we didn’t mind too much as we were too busy getting caught up but it took us quite a while to get someone to take our order despite trying desperately to catch the eye of one of the waiters. 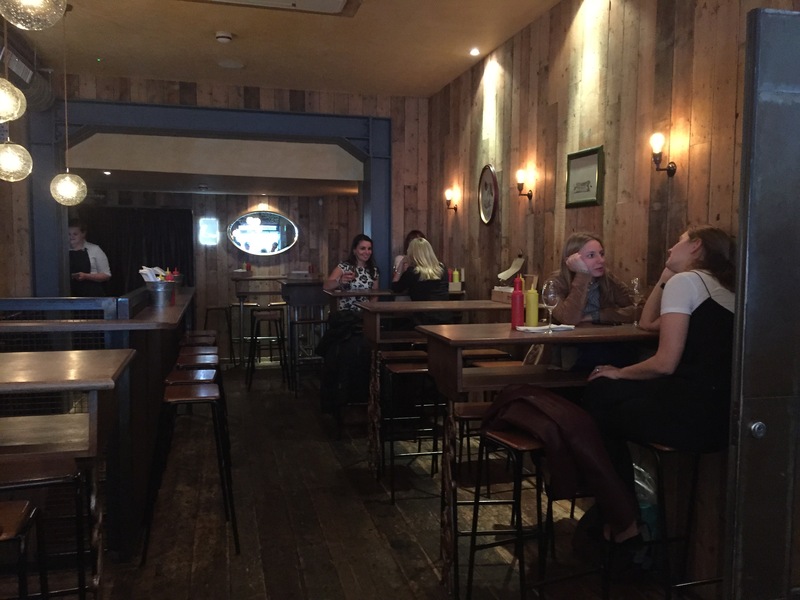 It’s definitely a fun concept to indulge in once and the place certainly filled up around us as the night went on with people waiting outside when we left so it’s obviously a popular location but I think you can probably get more bang for your buck elsewhere in London. I love your honest reviews. I’m not a big hot dog fan, but those sweet potato fries do look scrumptious!